The taught component of this MA has covered a variety of topics and a range of literature. The correlation of subject matter between the Old and Middle English strands has helped to highlight the connection between these two periods in literary history, despite the apparent lack of identity of the literature of the transition period in around the twelfth century. While examining the relationship between medieval religion and the language of satire I came across a chapter entitled “The Exeter Book Riddles and the Place of Sexual Idiom in Old English Literature” in Medieval Obscenities (ed. Mc Donald). In this chapter Glenn Davis states that”[e]arly critics, fuelled by a combination of their own distaste for these riddles’ salacious content and a belief in the homogeneously orthodox landscape of the late Anglo-Saxon church, worked hard to separate them from the rest of the Old English literary corpus” (39). Davis goes on to state that “many of those early prejudices persist” (39). However, these riddles make up about one third of the content of the Exeter Book, which also contains the largest extant collection of Old English poetry. The Book History component of the course led me to research the manuscripts such as the Exeter Book in order to better understand their function and modes of utility. A combination of several aspects of the course have led me to Exeter Book and its riddles as a research topic. I aim to explore the riddle tradition from antiquity to the Middle Ages and its connection to the Old English riddles, the connection between the Exeter Book riddles and the manuscript that contains them, and position of the riddles in the Old English canon. Hulbert, James R. Bright’s Anglo-Saxon Reader. Maryland: Wildside, 2008. Print. Mc Donald, Nicola. Medieval Obsenities. York: Boydell, 2006. Print. The suppression of monasteries and the wars of the 15th and 16th centuries have meant that what survives of Anglo-Saxon literature is scant. What survive are about 400 manuscripts containing various texts in the form of chronicles, hagiographies, laws, charters, poetry, scientific treatises, gospel translations, and sermons. The largely pietistic theme of the texts seems to reflect the ideology of the society that produced them. Most of these manuscripts were written by monks and holy men, who either copied the texts from existing manuscripts or recorded examples from oral culture. It is interesting to note that all surviving Old English poetry is preserved in four manuscripts – The Junius Manuscript, The Exeter Book, The Nowell Codex and The Vercilli Book. The Junius Manuscript contains biblical poetry such as Genesis and Christ and Satan. The Vercilli Book is largely religious in nature, containing both poetry and homilies. The Nowell Codex contains poems such as the epic Beowulf, and prose works such as Solomon and Saturn.The Exeter Book is a unique manuscript in that it holds a large collection of poems interspersed with over ninety riddles. While the theme of the Exeter Book’s poetry is largely religious, the riddles explore various subjects ranging from religious allegory to mundane household objects. Their subject matter, form and genre are unique among the corpus of Old English extant texts, and for this reason I have chosen the Exeter Book riddles as the subject for my final essay and thesis. The study of ancient manuscripts offers a great deal of information about the history of the book and the progression of texts from oral to written form. They also act as a valuable source of information on the cultural and social habits of their readers and writers. One such text is the Exeter Book. The Exeter Book contains a large selection of miscellaneous Anglo-Saxon poetry in manuscript form. It dates from about 960-980 and is thought to have been written by just one scribe (Blanchard and Schriber). Richard Gameson states that “its importance for the study of pre-Conquest vernacular literature can hardly be exaggerated” (135). Of the four codices of Anglo-Saxon poetry that exist, the Exeter Book is the only one in which there does not seem to be a uniformity in the poems selected for inclusion in the text (Lawrence 2). This in itself can reveal a lot about the scribes and their audience. Interestingly, the Exeter Book contains several hundred corrections which, according to Bernard J Muir, “reveal a great deal about how one particularly careful scribe worked, and perhaps more about the working habits of Anglo-Saxon scribes in general” ( 150). The fact that so many corrections were made suggests that the scribe was using a standardised language for writing. However, “[t]he standardised language in the codex is not by any means uniform”, and there are variations in spelling (Lawrence 5). While there is a lack in uniformity of spelling, the Exeter Book is a valuable source for examining the development of the English language in the tenth century. The selection of texts contained within the manuscript of the Exeter Book is also worth studying, as it contains a selection of ninety-seven riddles on various subjects juxtaposed with several examles of religious poetry. Blanchard, Laura B., and Carolyn Schriber. 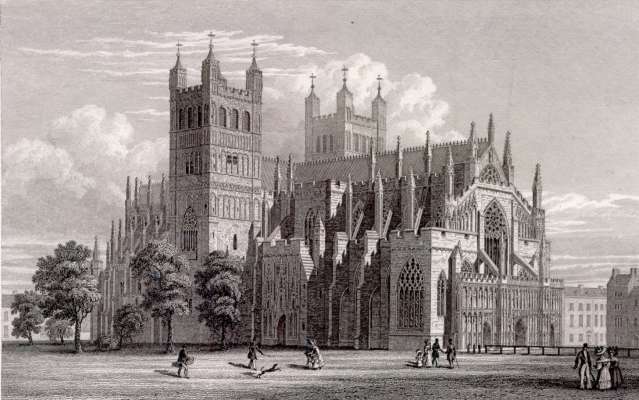 “The Exeter Book: Introduction.” ORB: The Online Reference Book for Medieval Studies. 1995-1999. Web. 30 Sept. 2011. Gameson, Richard. “The Origin of the Exeter Book of Old English Poetry.” Anglo-Saxon England 25 (1996). Print. Lawrence, David Herbert. The Phoenix. Manchester: University ND, 1968. Print. Muir, Bernard James. “Editing the Exeter Book: AProgress Report.” Medieval Texts and Images: Studies of Manuscripts from the Middle Ages. Ed. Margaret M. Manion and Bernard James. Muir. Chur: Harwood Academic, 1991. Print. 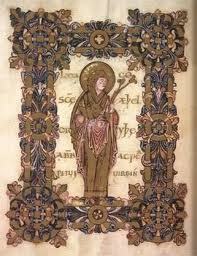 In the last decade some research has been done on the constitution of pigments found in Anglo-Saxon manuscripts. Before 1998 “nothing had been published on Anglo-Saxon manuscript pigments that is not questionable” (Clarke 231). As manuscripts hold an abundance of evidence for medieval historians, the study of their composition is important. Studying the materials of ancient manuscripts gives us insight into artistic styles, materials, social changes, wealth and status, trade and commerce (Brown, Society 430). The artist-scribe would have had to have been a skilled chemist in order to create the palette of colour needed some elaborate manuscripts. Purples, blues and crimsons were made by changing the pH of plant extracts such as woad and lichens; green was made from suspending copper over vinegar; crushed shells or eggshells were used for white pigment; a trisulfide of arsenic created yellow (Brown, Labyrinth 35). The pigments were mixed with a beaten egg white to form an adhesive. Ink was made from oak galls and iron salts, which contributes greatly to the preservation of manuscripts as this type of ink does not fade. Exotic pigments were also used such as ultramarine made from lapis lazuli, a rare semi-precious stone that would have been sourced from Persia. The presence of lazurite is evidence of the trade routes, such as those between England and Afghanistan. Examination of pigments is also vital in order to determine the correct conservation strategy, and can help in establishing the origin of a manuscript. 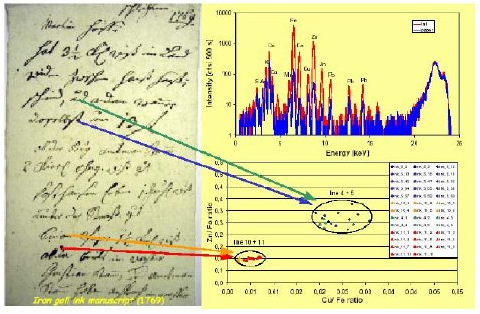 Methods used for the analysis of manuscript pigments include micro-Raman spectroscopy, X-ray fluoresecnce and near-IR imaging. Brown, Michelle P. Painted Labyrinth: the World of the Lindisfarne Gospels. London: British Library, 2003. Print. —. The Lindisfarne Gospels Society, Spirituality and the Scribe. Toronto: University of Toronto, 2003. Print. Clarke, Mark. “Anglo-Saxon Manuscript Pigments.” Studies in Conservation 49.4 (2004): 231-44. JSTOR. Web. 10 Feb. 2012. The topic for strand B this week was medieval humour, particularly in Chaucer’s “The Summoner’s Tale” and the Anglo-Irish poem The Land of Cokaygne. Both texts adopt a crude type of satirical humour, which at times seems to border on childishness. However, the context of the texts suggests an attempt to portray a dark message about the seriousness of vice. The profanity of The Land of Cokaygne is intrinsically linked to the piety of the texts beside it in Harley MS 913 . Likewise there is a juxtaposition of profanity and piety in The Canterbury Tales. The Land of Cokaygne takes the seven deadly sins and applies them to a paradisaical fantasy land in which the clergy operate under the controls of Vice. While some critics try to pinpoint the Irish monastery at the centre of the ridicule, it may also be suggested that the poem is more representative of every cleric than of an individual. Chaucer similarly ridicules the vice of the greedy friar in “The Summoner’s Tale”. “The Summoner’s Tale” follows a structure similar to that of the French fabliaux – a climaxical trick followed by poetic justice (Finlayson 457). It is part of the goliardic tradition of satire, originated by clerical students who were dissatisfied with the contradictions within the Church. Humorous literature did not originate in the middle ages. Jonathan Wilcox suggests that “Old Norse literature is full of it [humour]” (2). However, humour is more difficult to find in Anglo-Saxon literature, at a time when Benedictine rule forbade “violent laughter”. Wilcox also notes the similarity between the word for laughter, (h)leahtor, and that for sin, (h)leather (2). As with Middle English, humour in Anglo-Saxon texts often appears in unexpected forms such as the maginalia and illustrations of religious texts. It is possible that humour was employed as a pedagogic strategy, which would explain its position within such pious texts. The examination of medieval humour can reveal a lot about the society in which it was produced. Wilcox, Jonathan, ed. Humour in Anglo-Saxon Literature. Rochester, NY: D.S. Brewer, 2000. Print. This week I did a presentation on the topic of “Insular illuminated manuscripts and their presence in an oral society”. The Anglo-Saxons were a largely oral people. Literacy was confined to “those of the aristocratic stratum of society, and those who chose to enter a monastic or regular religious life” (Treharne xxv). Works such as Beowulf and Cædmon’s Hymn were recited and committed to memory. They were transmitted orally before they were written as text. The creation of a manuscript was an expensive and time-consuming process, therefore the texts that were transformed to codex form were generally considered to be important in terms of social and cultural advancement. In his translation programme for educational reform, Ælfred included only those texts which he considered “most necessary for all men to know” (Keynes and Lapidge 126). These included texts that were thematically Christian or historical in nature. It is evident, then, from examining the genre of texts in circulation in Anglo-Saxon England that religion played an important role in society. Hence, it is not surprising that the most elaborate and lavishly decorated manuscripts of the period consisted of religious content. 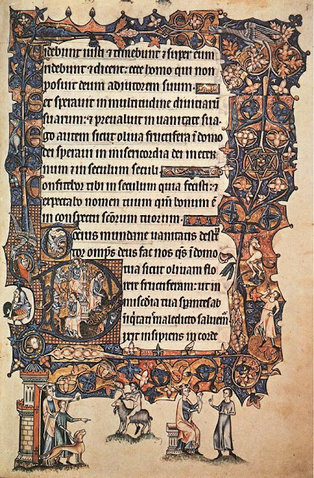 Insular illuminated manuscripts, created between the sixth and ninth centuries, are those that contain what is termed “insular art”. The word “insular” comes from the Latin insula, meaning “island” (O.E.D). This type of art is a distinct style that was common in Britain and Ireland during this period. The earliest insular example is the Durham Gospel Book (Meehan 23). However, what survives of the Durham Gospel Book is in poor condition. The Book of Durrow and the Book of Kells are associated with both Ireland and Iona; their place of origin cannot be definitively decided upon. 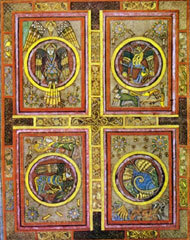 The Book of Durrow contains a copy of the four gospels in 248 folios, “accompanied by pages of ornament by an artist who produced some of the most striking images in insular art” (Meehan 9). Its decoration is closely related to that contained in the Book of Kells, although they were composed at opposing ends of the period in question. Bernard Meehan suggests that “both the extent of its decoration and the sophistication of its execution” (9) are evidence that the Book of Durrow was not the first manuscript of this type to be produced. These manuscripts are carefully preserved today and considered to be works of art. It is evident from the amount of work taken to produce them that they were also considered works of art when they were created. For example, the codex of the Lindisfarne Gospels – which contains the Latin script of the gospels of the four evangelists, as well as intricately illuminated carpet pages, incipit pages and illustrations – was remarkably created by just one man. Normally manuscripts of the time would have been created by a team of about eight monks. 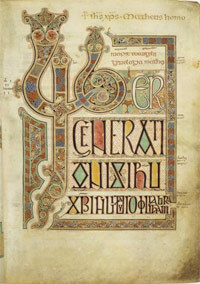 The Lindisfarne Gospels would have taken up to ten years to create. However, Werner Kebler believes that the gospels have no place in an oral society: “How can it be both removed from and committed to orality?” (217). Laymen could only learn to read and write by joining a religious order, and aristocracy was “the sector of medieval society in which one would expect to find the only readers and writers” (Avrin 207). Kebler argues that the gospels “go against the grain of basic and oral impulses” (207). Yet the insular illuminated manuscripts are very much about the visual aspect. Such elaborate illustrations hint that they were designed to be viewed. Pope Gregory the Great said that “pictures are for the illiterate what books are for the literate” (Green 126). The manuscripts can also be understood in terms of exegesis and the four levels of interpretation – literal, allegorical, moral and anagogical. In his Preface to his translation of GenesisÆlfric mentions the “gastlice andgit” (ghostly significance) of allegory and alludes to exegesis (Wilcox 117). The elaborate and symbolic artwork is especially open to this type of interpretation. In both the Book of Durrow and the Lindisfarne Gospels, the “evangelists themselves appear with their symbols rather than as symbols alone” (Avrin 242). Art such as this may be interpreted by both the literate and the illiterate, and by those who were proficient in the language of the manuscripts (Latin) and those who were not. Walter J. Ong supports the view that oral and literary traditions existed simultaneously in the Anglo-Saxon era. He believes that “even after the introduction of writing, oral mindsets and ways of expression have persisted in literary works everywhere, from antiquity to the present day” (Textualization, 1). This is opposed to Kebler’s argument that “preservation of oral tradition is not a primary function of writing” (207). It is also evident from Ælfric’s Preface to his First Series of Catholic Homilies that the oral tradition and the literary tradition could work together in his society, as he expected his translations to be transmitted “either by reading or hearing it read”(Wilcox 127). This is what Ong terms “secondary orality”, that is reading to be heard aloud (technologizing, 6). Ong also makes the point that “[s]uch experience of physically matching printed books, together with our late typographic habit of silent reading, has subtly altered our sense of the text by dissociating it notably, though never of course entirely, from the oral world, making the book less like an utterance and more like other visible and tangible ‘things’” (Textualization,2). This emphasises the fact that illuminated manuscripts held an important place in an oral Anglo-Saxon society. More importantly, George Henderson states that Pope Gregory had “strong views on the usefulness of images in teaching Christianity to pagans”, and he believes it likely that Pope Gregory sent books over to England that were “enriched by art” as part of his plan for conversion of the pagans (14). While Ong believes that a modern society cannot fully understand the function of books in an Anglo-Saxon context, by examining the lavish illuminations that remain it can be inferred that these manuscripts held and important place in an oral society. It may not be known to what extent they could be used by the illiterate but the fact that they were preserved in monasteries and remain largely intact to this day is evidence for their revered status in an oral society. Avrin, Leila. Scribes, Script, and Books: the Book Arts from Antiquity to the Renaissance. Chicago: American Library Association, 1991. Print. Green, Dennis Howard. 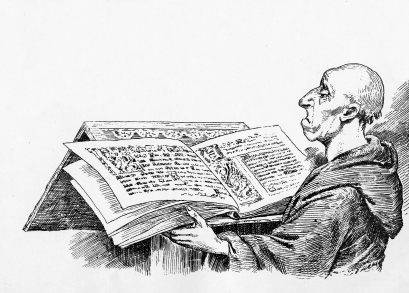 Medieval listening and reading: the primary reception of German literature, 800-1300. Cambridge University Press, 1994. Print. Henderson, George. Losses and Lacunae in Early Insular Art. Vol. 3. York: University of York Medieval Monograph Series, 1982. Print. Kelber, Werner H. The oral and the written Gospel: the hermeneutics of speaking and writing in the synoptic tradition, Mark, Paul, and Q. Indiana University Press, 1983. Print. Keynes, Simon, and Michael Lapidge. Alfred the Great: Asser’s Life of King Alfred and Other Contemporary Sources. Harmondsworth, Middlesex, England: Penguin, 1983. Print. Meehan, Bernard. The Book of Durrow: a Medieval Masterpiece at Trinity College Dublin.Dublin: Town House, 1996. Print. Ong, Walter J. Orality and literacy: the technologizing of the word. Routledge, 2002. Print. Ong, Walter J. “Orality, Literacy, and Medieval Textualization.” New Literary History 16.1 (1984): 1-12. Print. Simpson, J. A., and E. S. C. Weiner. The Oxford English Dictionary. Oxford: Clarendon, 1989. Print. Treharne, Elaine M. Old and Middle English: C. 890 – C. 1400 : an Anthology. Oxford: Wiley-Blackwell, 2010. Print. Wilcox, Jonathan, ed. Aelfric’s Prefaces. Durham: Durham Medieval Texts, 1994. Print. This week the theme of femininity was continued in both strands. Strand A involved the examination of two versions of the life of St. Æthelthryth of Ely – in Bede’s Historia Ecclesiastica and the Liber Eliensis. While the hagiography of St. Æthelthryth is a different genre to the mystical and autobiographical middle-English Book of Margery Kempe, it is interesting to note the similarities between the texts. The fact that Margery’s book is autobiographical makes it more modest. She continually refers to herself as the “creature”. However, because it is an account of her memories as they come to her mind it is often quite rambling and fragmented. She refers to herself in the third person, which is both distancing and objective. The Liber Eliensis is also quite objective, aiming to collect information on St. Æthelthryth from a number of sources. The fantastical elements are more profound in Margery of Kempe, when compared to the miracles of St. Æthelthryth. Margery’s marriage to God in chapter 35 is both mystical and spiritual. This is comparable to the representation of God as a bridegroom in the hagiographical Liber Eliensis. What I found most striking about the similarities of the texts was the fact that both Margery and Æthelthryth turned to a life of chastity after several years of marriage. However, while Margery had fourteen children, it is reported that St. Æthelthryth preserved her virginity throughout two marriages lasting a combined fourteen years. For the first half of this term the seminars will focus on Gender and Performance as a topic. The Strand A seminar concentrated on masculinity, and competing views of its definition in Ælfric’s Lives of Saints and The Battle of Maldon. Ælfric’s Life of St. Edmund is a prose account of the saint and martyr King Edmund. Edmund chooses to thrown down his armour when faced with the threat of the Danes, thus creating a tension between sanctity and heroism. The Battle of Maldon, however, advocates violence and heroism. Yet both texts are idealised versions of historic events, with their models of masculinity adapted to suit the mode they are written in. What the texts have in common is their treatment of women. Both texts bypass the role of women in Anglo-Saxon society, and the women in the texts are only mentioned in passing. The text for Strand the B, however, was written by a women. The Shewings of Julian of Norwich is an account of Julain’s mystical experience of the Passion of Christ. Julian’s vision is non-verbal so she concentrates on a vivid description of the visual. This is a very long and repetitive account of a singular idea. At times her narrative is also quite rambling, in contrast to the more straightforward revelations contained in religious lyrics. What I found most interesting about this seminar was the background reading and examining the transition from the Old English alliterative line to the stanzaic form of the Middle English lyric. It is also interesting to note the change in theme between these two periods. For example, the Anglo-Saxon The Dream of the Rood portrays Christ as a heroic young warrior. In Middle English devotional poetry the focus switches from the heroism of Christ’s battle with the devil to Christ’s love for mankind and his sacrifice. Christ becomes the central figure of the narrative. 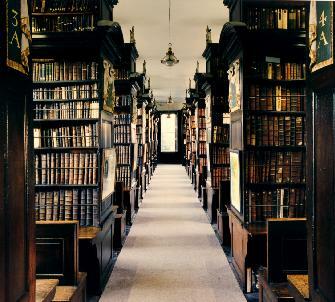 This week’s seminar on early modern print and authorship took place in Marsh’s Library, Dublin. This was a particularly interesting class as the resources of Marsh’s Library helped to bring the lecture topics to life. On of the most engaging topic of the day was the exploration of the relationship between handwritten marginalia and the layout of the printed book. This evolution could clearly be seen by examining the books themselves. Firstly, there was a sixteenth-century grammar school textbook, Ioachimi Fortij Ringelbergij Antuerpiani Rhetorica (1554), which had both interlinear marginal handwritten annotations – a record of early active reading. Another type of development of the book could be seen in Ben Jonson’s Volpone (1607) which contained a handwritten list of contents. This was inserted before the idea of genre has really developed, so it was interesting to see that it was listed alongside other comedies and tragicomedies. This also illustrated the fact that books continued to be developed after they were printed. This in turn led to printed marginalia, which could be seen in a 1601 version of Ovid’s complete works. The verse itself was situated in the centre of the pages surrounded by the marginalia, which would have been compiled from a number of sources and supplied to the print shop to assemble. The library also contained A complete collection of the historical, political, and miscellaneous works of John Milton (1698). This is quite a unique copy in that it sets Milton up as a canonical author. The text is set up almost as a commercialisation of the author. This can be compared to the way in which the production of the Folios of Jonson and Shakespeare also operated in a commercial manner. This raises questions about the role of the author in the early modern period and the importance of authorship. The printing of these Folios was revolutionary in that up until this point printing was reserved for high status documents such as historical, religious and legal documents. The trip to the library ended with a very informative talk on book preservation from the Conservation Binder. This week’s seminars concentrated on the theme of authorship. It was interesting to research the idea of late medieval vernacular authorship with regard to Chaucer’s presentation of his status as an author. During the Middle Ages there was not a clear sense of authority in the English vernacular. Texts could be adapted for different readerships and contexts, and each scribal version was different. The discussion on dramatising female speech was also quite engaging. 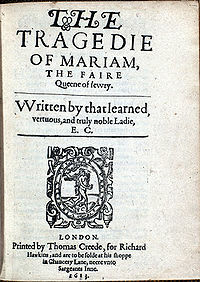 This seminar focused on the female voice in Elizabeth Cary’s The Tragedy of Mariam. This play begins with a female soliloquy, which was quite unusual at the time. This sets the tone for the rest of the play which goes on to question the patriarchal culture of the seventeenth century. Cary questions issues surrounding the the triad of virtues associated with the “ideal woman” – silence, chastity and obedience. There is a strong emphasis on the connection of language and voice to promiscuity throughout, and this is connected to the idea of gender and authorship, and the place of women’s writing in a patriarchal society. The Tragedy of Mariam is useful in examining the female voice and opinion on these social restraints, but it is also interesting to compare this with the male viewpoint in William Shakespeare’s The Taming of the Shrew. Shakespeare similarly questions the male patriarchal system and concludes his play with as much ambiguity regarding personal opinion as Cary does.